Arterial blood gas is a test to look for gases in the blood. This test determines the amount of oxygen and carbon dioxide dissolved in the blood, as well as the acid/base status. Oxygen and carbon dioxide levels are indicators of lung function. The acid/base status provides information on how well the lungs and kidneys are functioning. It can also give information as to whether there is a problem in the body, like an infection, that is throwing off the acid/base balance in the body. If you are undergoing oxygen therapy , this test can help to see if the therapy is effective. If the blood is going to be taken from an artery in the arm, an Allen test will be done. This test will be used to evaluate blood circulation. During the Allen test, the technician will press the radial and ulnar arteries in the wrist. This will cause your palm to turn white. 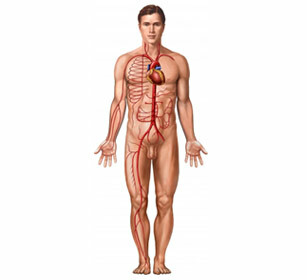 When the arteries are released, the skin will turn pink and flushed. If your skin does not flush within 5 seconds, this will indicate that you have decreased blood flow to your palm. Another puncture site will need to be chosen. The puncture site will be swabbed clean. The needle will then be inserted into the selected artery. Blood will be withdrawn. The needle will be removed. The technician will put pressure on the puncture site for about 5 minutes. If you take a blood-thinners, it may take longer for the bleeding to stop. Once the bleeding has stopped, a bandage will be placed on the site. You will leave the bandage in place for 30-60 minutes. You will need to keep the site clean. Based on the test results, your doctor can assess your lung and kidney function. Arterial blood gases. Patient website. Available at: https://patient.info/health/arterial-blood-gases. August 22, 2017. Accessed November 30, 2017. Blood gases. Lab Tests Online—American Association for Clinical Chemistry website. Available at: https://labtestsonline.org/understanding/analytes/blood-gases/tab/glance. Updated june 4, 2017. Accessed November 30, 2017.